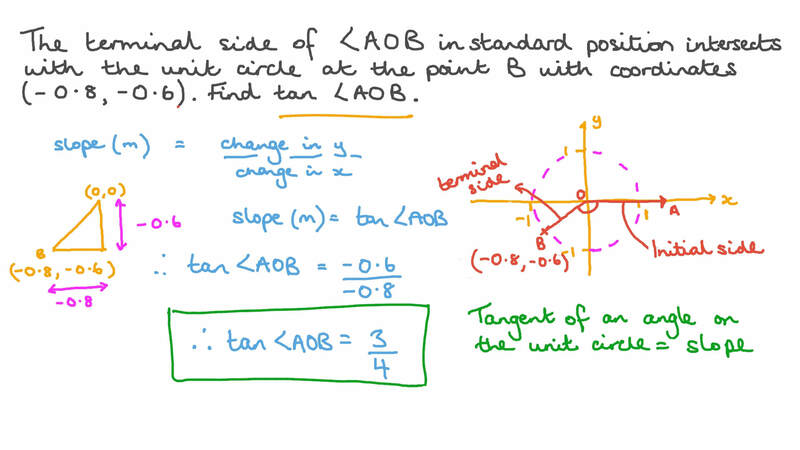 In this lesson, we will learn how to find the exact values of the trigonometric ratios of a standard position angle whose terminal side passes through a given point. The terminal side of ∠ 𝐴 𝑂 𝐵 in standard position intersects with the unit circle at the point 𝐵 with coordinates ( − 0 . 8 , − 0 . 6 ) . Find t a n ∠ 𝐴 𝑂 𝐵 . Find c o t 𝜃 given 𝜃 is in standard position and its terminal side passes through the point  − 8 1 7 , 1 5 1 7  .